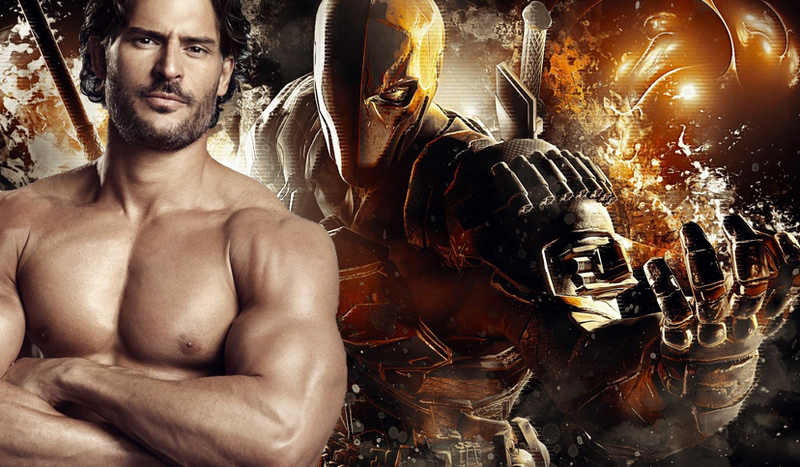 Joe Manganiello to play Deathstroke! Last week, Ben Affleck created madness for BATMAN fans around the world when he released an unprompted and unexplained video of Deathstroke in uniform on the set of Justice League. The Wall Street Journal has now confirmed in an interview with Geoff Johns that the man behind the mask is none other than Joe Manganiello and confirmed that he will be the villain of Ben Affleck's upcoming Batman movie. Johns would not confirm whether Deathstroke will make an appearance in Justice League, though the short clip of the character strangely enough was seen filming on one of the sets for the film. Plus, if he was to only be in the Batman solo film why would he already be in costume when the BATMAN film has not yet started filming!!!!! Personally I can't say I'm THAT excited, I never was a Deathstroke fan and when he first appeared way back in the The New Teen Titans back in 1980, (YES, I have the whole Collection!) I actually got bored of him. I just found him a pretty dull character for the comics and yes I know, I'm probably 'one on my own' in that respect as I know he's become a massive favourite amongst the fans! Maybe I'm too much of a traditionalist! However I have to admit, he does look pretty kewl in the video and particularly menacing and for once the costume designers seem to have stuck quite close to the original source material, especially keeping the bright orange, even though he's not wearing the pirate boots! With the massive success of the Arkham Video games I can see why the decision was taken to use Deathstroke in the films. My only hope is that the film is not 'JUST' Deathstroke and the producers have found a way to include Jared Letto's Joker somewhere in the plot, just like they did with 'Suicide Squad'. Hopefully by now most people will have realised the film was NOT about the Joker, it was just his introduction to the DCEU. As I just said I'm a 'traditionalist' through and through when it comes to Batman and it's Joker that is Batman's true arch enemy, without the Joker, there is NO Batman! I only hope that these films are a lead up to the Jokers all out war on Batman! Created by Marv Wolfman and George Pérez, Deathstroke is a famous mercenary in the world of DC Comics who has gone toe-to-toe with the Dark Knight on multiple occasions and actually beaten him in hand-to-hand combat more than once. Affleck is slated to direct the film and has co-written the script alongside Johns. No official release date has been announced for the project, though Affleck previously said he wouldn’t begin production until the script was completed. Warner Bros. previously set release dates for two untitled DC projects on October 5, 2018 and November 1, 2019, meaning the film could take one of those dates.